While we were in Las Vegas, there was some free time, because the grandchildren were attending school, and their parents had work. What does one do in Las Vegas when one has free time? We shop and we dine and look for wine, the first two endeavors are endorsed by my Bride, while all three endeavors are pleasant for me, though the last option can cause concern for my Bride. My Bride is the Exchequer of the funds and she is always trying to keep me fiscally responsible, which truth be told, is a full time occupation even when we are on holidays. Since neither of us gambles, the main Siren call of Las Vegas has never had an affect on us. We were checking out a beautiful new shopping district called Downtown Summerlin. This is a totally created downtown environment that has the look and feel of a downtown for a medium size community and without the glitz and glamour of The Strip and the shopping that is found there. After we had shopped for a while, we thought of having food and of course a glass or two of wine, perchance to even share a bottle, if we could find something interesting. We wandered into a little bistro that is a part of a chain run by a notable name in the culinary field. Since I ended up a bit addled and I forgot what we had, lunch was not all it could have been (and that is all my fault), I will refrain naming the restaurant or the food that we had. 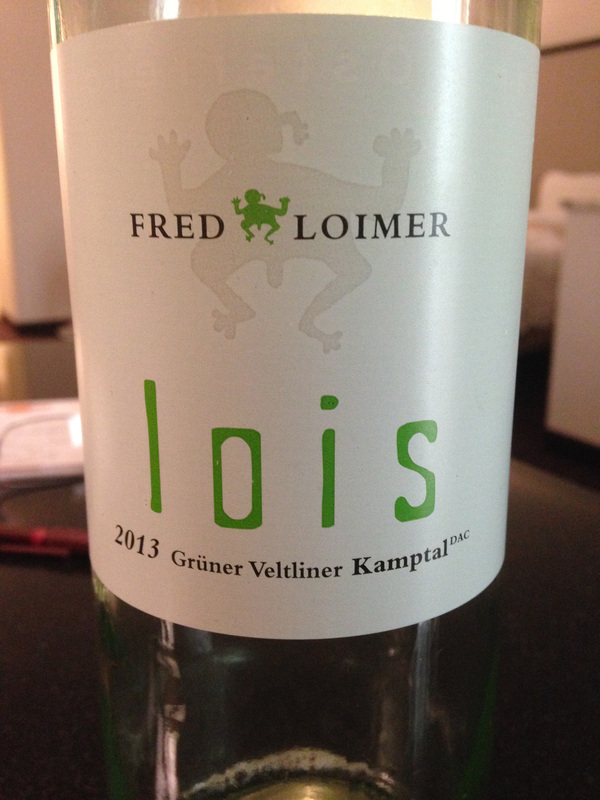 I will say that we did enjoy a bottle of Fred Loimer “Lois” Gruner Veltliner 2013 and it was very enjoyable. This was a trocken or dry wine from the Kamptal Valley of Austria and Gruner Veltliner is the signature grape varietal for the country, and it has only been in the last couple of years that we actually tried some of these wines. The “what if?” of this article, is that I was going to drive my Bride crazy, because I was looking at the wine list, in fact, I tend to look at this carte, prior to looking at the menu. 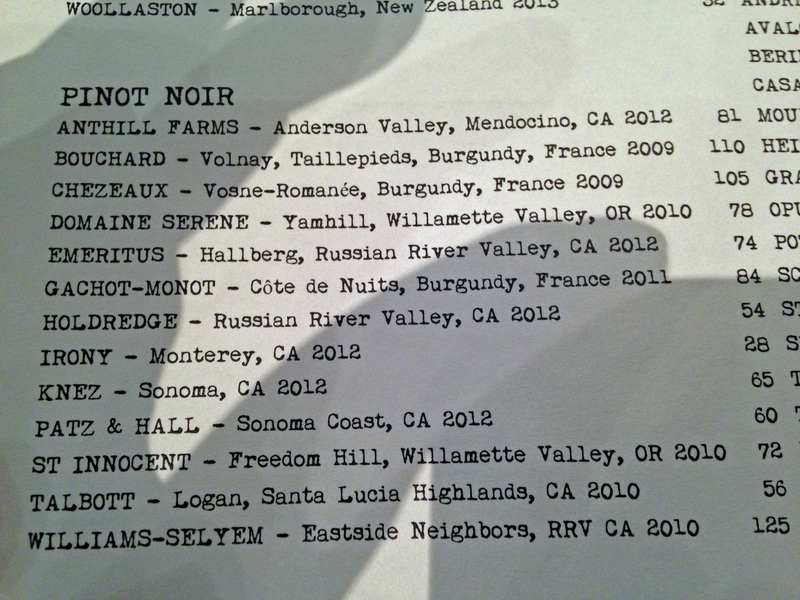 There was a wine listed that immediately caught my attention, much to my Bride’s consternation. There in the listing for the Pinot Noir wines was “Chezeaux Vosne-Romanee 2009,” at a very low price even for a restaurant. Now I have to admit, that my first thought was that this was an error, because I had never heard of “Chezeaux” and I immediately thought of Echezeaux, a Grand Cru from the village of Flagey-Echezeaux, which is often lumped in with their far more famous neighboring village of Vosne-Romanee in the Cote de Nuits of the Burgundy region of France. The village was actually first known as Vosne, but with the famed notoriety of the cru La Romanee, that appended that plot to the town’s name. Now you can understand my excitement that I thought that they had forgotten to type an “e” at the beginning of the word “Chezeaux,” and my Bride was getting worried that I was going to go overboard on the price of our lunch. Alas, they could not find the wine and we settled on the bottle of “Lois” which was a good choice with our lunch. If you asked my Bride about this she will say that I must have lost my mind; though I have to admit that I mentally belabored and lamented the thought about missing the chance to get a bargain priced Echezeaux. I kind of pride myself that I have most of the villages of Burgundy memorized, as well as most of the Grands Crus and the Premiers Crus, just in case a situation like this falls into my lap. After doing some research after the meal, when I was more serene and at peace with the world I discovered that there is a negociant in Burgundy Jerome Chezeaux and they have a Vosne-Romanee 2009 and he was under the radar for me. Every day is a new day to try some wine, and more important to learn about wine. This entry was posted in Wine and tagged Austria, Burgundy, Echezeaux, Flagey-Echezeaux, France, Fred Loimer, Gruner Veltliner, Kamptal, Lois, Pinot Noir, Vosne-Romanee. Bookmark the permalink. 1 Response to What If?